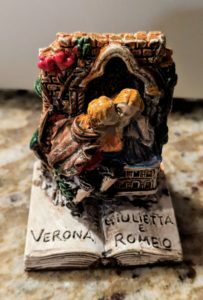 Turns out one of her friends went to Italy for vacation and, while in Verona looking at “Juliet’s balcony”, decided that she had to bring my daughter home a present. On the one hand it’s a just little tchotchke brought back from vacation, like a souvenir spoon or refrigerator magnet. But I see it quite differently. I see it a whole new generation of Shakespeare geeks. My daughter’s friends know that she’s “into Shakespeare.” So now they’re the ones seeing Shakespeare things in the world and thinking, “Hey, I should tell her about that.” Now my daughter’s actually starting her own collection of memories along those lines. Hopefully one day (NOT soon!) one of her kids sees this hanging out on a knick knack shelf, takes it down to admire, and starts hearing stories about Romeo and Juliet? My plan is working better than I could have dreamed. ‹ PreviousIs Shakespeare’s Library Still Out There? Those friends thou hast, and their adoption tried, grapple them unto thy soul with hoops of steel.